After five wonderful years in the east-end, NETTIE HORN has moved to new premises in Fitzrovia - our new address is: 17A RIDING HOUSE STREET, W1W 7DS (nearest tube: Oxford Circus) We will look forward to welcoming you at our new home in central London! Nettie Horn exhibits a diverse range of contemporary British and International artists. We focus mainly on exhibiting emerging artists with a solid and innovative practice who look beyond established and conventional forms. We encourage and promote experimentation and innovation by supporting new talent. The gallery aims to showcase a broad selection of works with emphasis on experimental techniques and materials. We present an integrated programme of exhibitions, including solo-shows of gallery artists as well as curated group exhibitions, introducing innovative developments in painting, sculpture, photography, performance, video and works on paper. I hope that you’ve all had a lovely summer break! 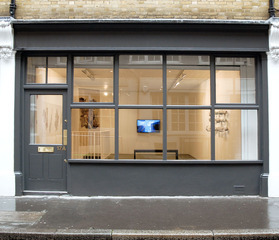 I wanted to let you know today that, after six wonderful and fulfilling years, NETTIE HORN will not be re-opening its doors for the start of this new season and that we have decided to give the gallery's space a little break in order to explore fresh challenges and projects in the art world. We feel very proud and fortunate to have accompanied our artists from their - and our - early days all the way to some amazing achievements such as Antti Laitinen's selection for this year's Venice Biennale or Bertille Bak's solo exhibition at the Museum of Modern Art in Paris recently - two of many other successes worth mentioning. Other than collaborating with some incredibly talented and inspiring artists in over 60 exhibitions and off-site projects, our most valued and cherished experience lies in the numerous relationships and friendships we have developed with many of you - having the opportunity to see you regularly either at the gallery, art event or at some far-away art fair! So thank you for supporting the gallery, our artists, and for making our personal and professional journey so rich and enjoyable! The next chapter will be equally as exciting and we will look forward to our paths crossing again very soon. In the meantime, if you would like any information on our artists or their work, do get in touch with me; I will continue to be here to support our artists and to respond to any enquiries that come our way. We will keep you all updated with our artists' exhibitions around the globe and information and images on their latest works and projects so we can stay in touch.